Why don't we involve learners in assessment more often??? Who knows! There are so many benefits! But if you don't know why... then you don't do it.... and you and your students don't see the results. "We have been using the clapping activity in many of our schools this fall. I would love to share with you about a wonderful morning we had a few weeks ago. We were with a K-12 staff who is looking deeper into self-assessment. We were focusing our time together on setting criteria and self-assessment, using the Knowing What Counts books as our guide. At the end of our time, we introduced the clapping activity. This is a favourite time with staff members – it allows for some craziness and rich interaction while making a powerful point! Anyway, we were having a lot of fun and there were some amazing clapping performances. After two participants, one of our judges emerged as a bit of a “nitpicky” judge – some of the audience members were feeling a little upset with him. Through a sidebar conversation, we determined it might be nice to have the judge provide an exemplar of what he was looking for. When we asked for an exemplar for our third participant, the “nitpicky” judge was quite reluctant at first but then got into it. He gave a great example of what he was looking for and it turned out what was in his head was not what he had indicated when helping to set criteria with the other judges. It ended up being a great conversation starter and the conversation went deeper once we got into the debriefing portion, not only with the judges but with the entire group. The talk went well into the lunch hour (we could smell the pizza) but they just had so much to unpack." Such great evidence of powerful learning. Enjoy the video clip of Sandra and think about using this learning activity with your learners - parents, colleagues, or students. PS The credit for this clapping activity is hard to trace and therefore credit is hard to give. We did not invent it. We first learned it from colleagues at Rick Stiggins' wonderful summer conference in the early 1990s. YES! Fredericton!! The week of August 12 - 16, 2013... two Institutes! For Leaders. Teacher leaders. School leaders. System leaders. And, you can turn it into a university credit course if you choose. 2½ day Institutes in August. You can find out more here. Here's the first page of the brochure. 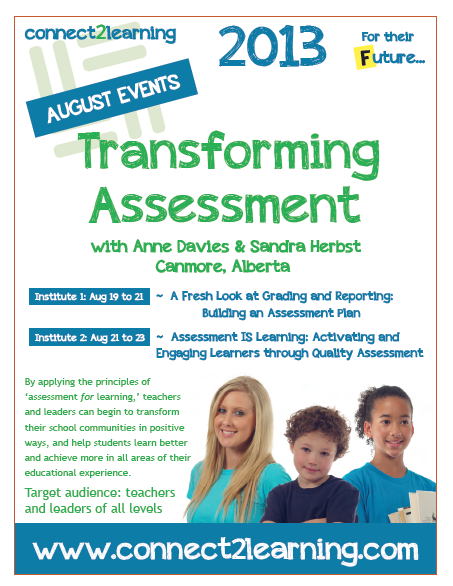 We are really excited about our two summer events in Canmore, Alberta! 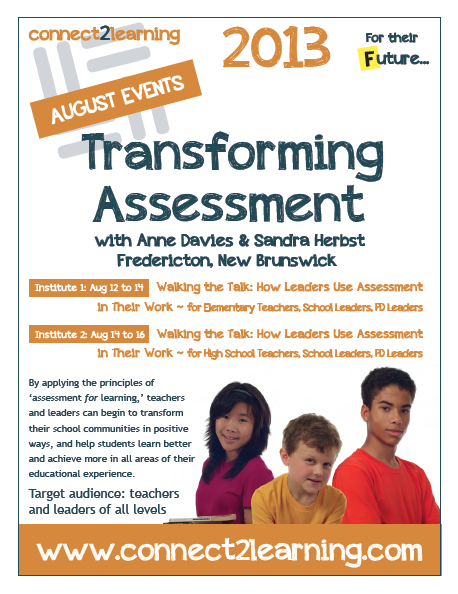 We have one Institute focused on constructing assessment plans. And, we have a second one focused on engaging learners from the first days of school. The brochure just got finished. What is the target wording? I want to use it with Grade 1's. I saw you speak on Friday and I really enjoyed it. I realize that I need to have my grade ones assessing themselves more. 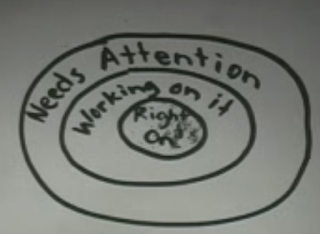 I really liked your target examples but can't remember the wording that was in the targets. I was wondering if you could send me a sample? I first saw this in the Edmonton Catholic School System in 2001. 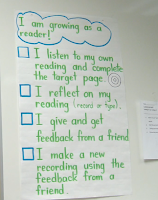 A teacher from each level shared the way they were using it to help students self-assess. This photo is the one Lisa McCluskey used. PS One quick note... the self-assessment will go a LOT better if you co-construct criteria first. What's important in a journal entry? You choose the question - it is about whatever you want students to know, do, and be able to articulate. 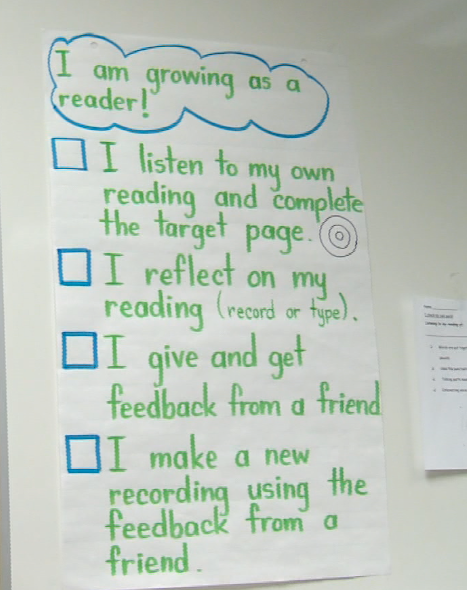 The reading example is from Jennifer Flight's Grade One classroom. The writing example is from Sue Smith's Grade Two classroom. 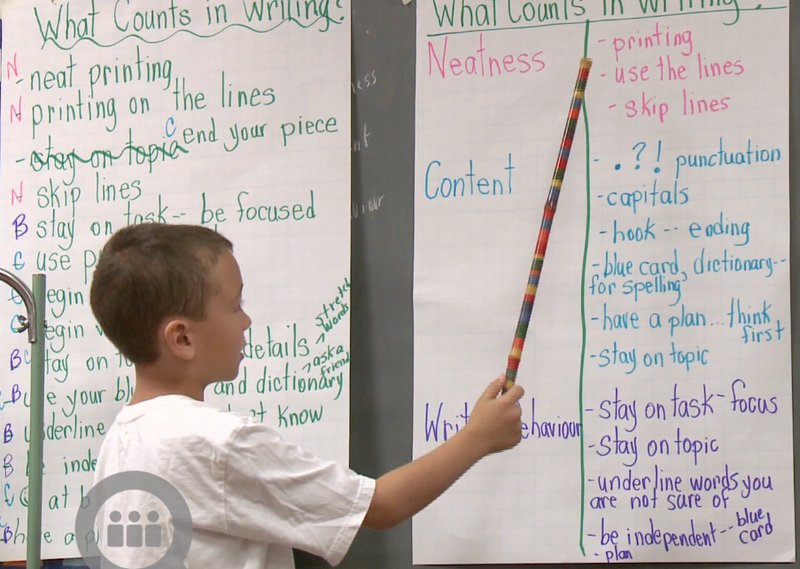 Once students have helped to set criteria, then get them engaged in doing. (Note: If you decide to skip the student involvement part you can expect this process to only work for your most able learners.) If you want to learn more about this process, read Setting and Using Criteria. Then, when they are part-way through the task, stop them and ask them to tell a neighbour one thing they are doing that shows they are good.... whatever it is. Then, when they are done have them again tell a neighbour. I would take a few days to have students involved in "telling" their self-assessments to other students and to you. Then, they can "show" their proof of meeting a specific idea listed on the criteria sheet (either in the work samples or by role playing the actions). Then, take the self-assessment to paper. Remember, when working with vulnerable learners, teachers need to be very conscious of the gradual release of responsibility... the deliberate move from me (the teacher), to we (all of us together) to me (students becoming independent). PS To save time and the environment, some primary teachers have stamps made with the 'target' on it. Then children simply stamp near the work they want to show for their self-assessment... then they just colour in the section on the stamp print on their work. They can also use the same colour to highlight the evidence in their work. They can stamp just about anywhere on their work (it saved a lot of copying and taping/gluing). 1. Ask students what's important when working as a group. List the ideas... without editing. 2. Give students a brief task to do in a group. Sorting a bin of items, composing a collection of words, or solving a word problem (don't make it too tough) - something that can be done in 2 -3 minutes. Afterwards, ask students if they noticed something else that is important when working in a small group. Add to the list.